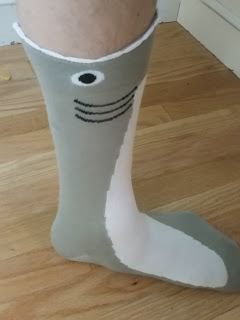 With Father's Day coming up, it seems like many of the men's sock manufacturers are coming out of the woodwork and asking me to review their socks. 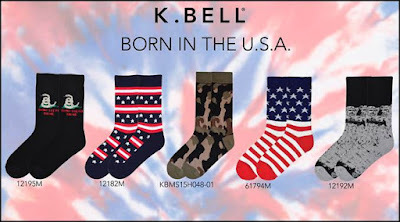 The latest one to do so is K Bell Socks. They're a 35-ish year old company out of Los Angeles with a focus on legwear. Not only do they offer men's socks, but also women's and kid's. Their spring catalog of men's socks includes 28 pages worth of product. Yes, they have that many styles just for men. Everything from Americana like flags and Mount Rushmore, to geometric, to sport, and novelty, among many others. I have to say the most unique I saw was the fish style, where it literally looks like your foot is in the fish's mouth. (picture below) Also, not all their socks are over the calf. There are other styles available. 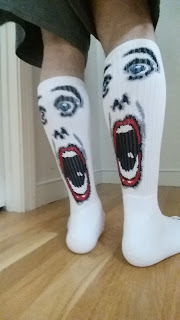 It just happens to be the only ones I asked and received for review are over the calf/crew socks. 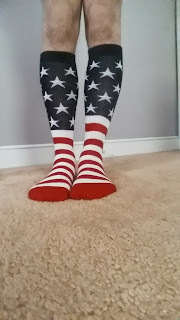 Price wise, the socks typically go for $10-13 / pair, where the American made varieties tend to be a little higher, or the styles are just more complicated. I never realized how varied the material used to make socks were. Many of the socks Iooked at are a blend of 80% Cotton / 15% Nylon / 3% Spandex / 2% Rubber. But I kept looking and others are 70% Pima Cotton / 28% Polyester / 2% Spandex. If you keep looking, you'll see even more combinations. I don't think the different material combos matter, they're just different. It was Memorial Day last week and I wore the flag socks they sent me. I didn't realize until now that I need to be more careful putting these on so they look more even. 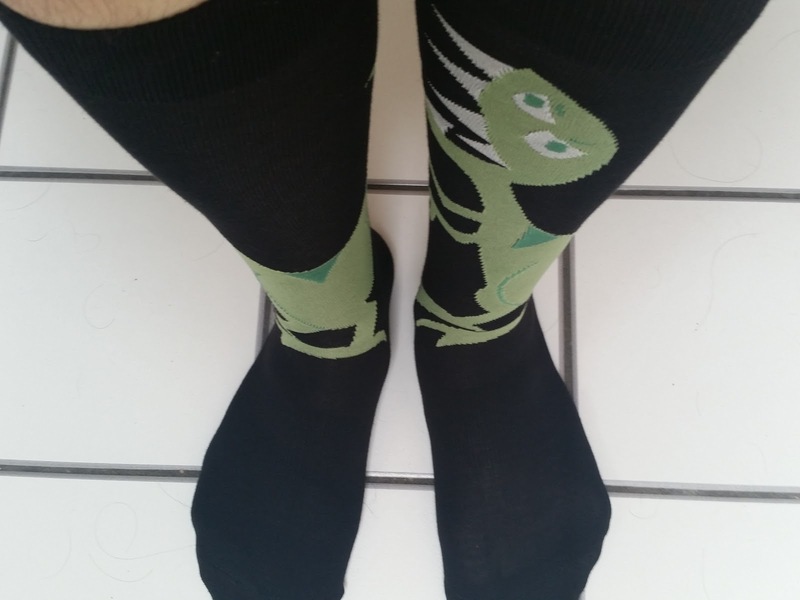 Very comfortable to wear and sized well for my size 10 feet, even if it looks like I pulled the left sock up too much. My favorite of the bunch is the funny styles like the dinosaurs. 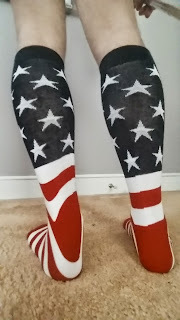 Like the flags, I need to be more careful putting them on so the two sides look even. If the socks are a geometric pattern, you don't have to be so careful, as they just repeat all over. Here's what the fish looks like eating my leg. The top of these socks are not flat, instead more of a mouth with teeth. Wear these with a pair of shorts and you'll get some interesting comments from strangers for sure. Don't be scared if you see these coming down the street. The K. Bell Socks would make great gifts for Father's Day. With all the different styles they offer, you're sure to find something VERY appropriate for that special person in your life. If you can't decide, just bring home the bacon. Everything is better with bacon. Does that actually hold true when not in its edible form? And, keep in mind many of the same styles are available for kids, too. 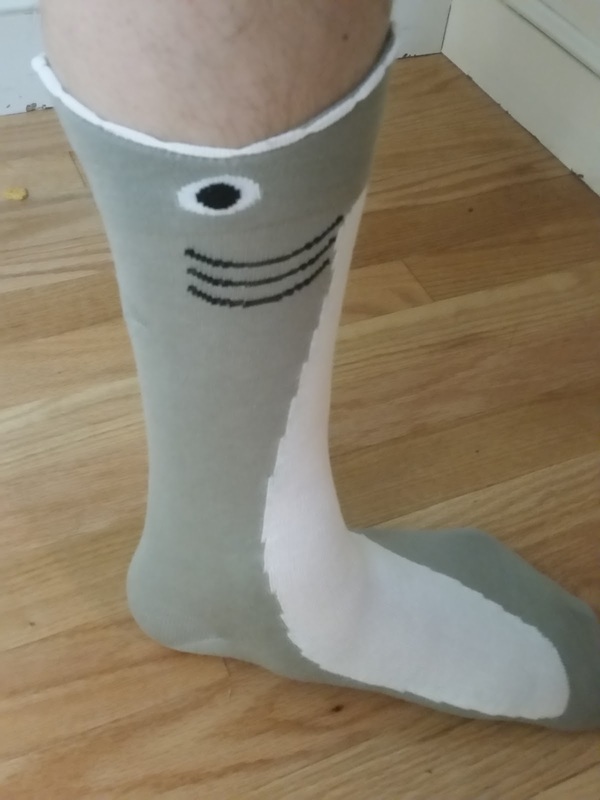 These are great socks, they would make a great gift. Thank you for sharing ths review.